Disclaimer: This post is sponsored by OttLite. All pictures and opinions are my own. I don't talk about our home that much here on Little Hiccups, but it's something that I get asked about fairly often by those who know me. With five people living in a small-ish, two bedroom apartment I'm often asked how we make it work. Our home is definitely not a tiny home (despite Ava's wishes that it was!) and by Bay Area standards, a 900sf apartment certainly isn't considered small, but it can get a little squishy at times. 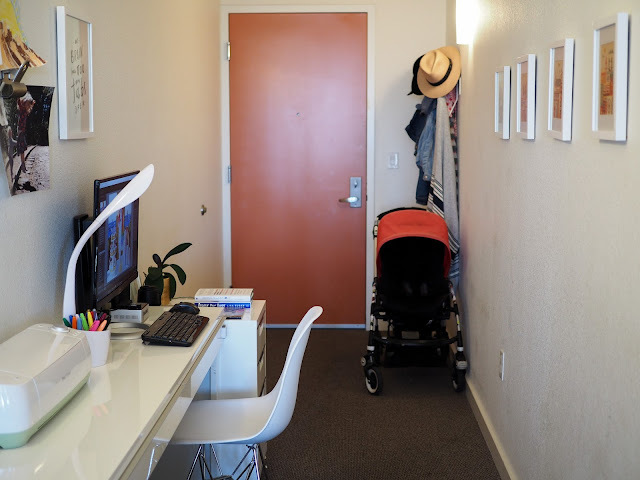 There are many challenges to living in a small space, and I hope to share some of my solutions on the blog one day (once I get around to fixing the biggest one - clutter!) but for now I wanted to share the space where I spend the majority of my waking hours - my "office". Creating an office space in which I can work comfortably has been a challenge in our apartment. 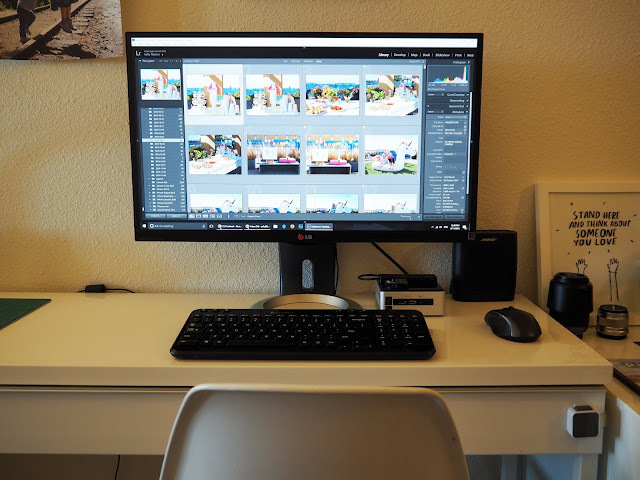 I'm not a fan of working on a laptop on the couch, especially when editing photos, so a dedicated desk space with a large monitor is important. Considering that I spend many hours a day sitting at it, having my desk located somewhere comfortable was a top priority when we moved into our apartment three years ago. 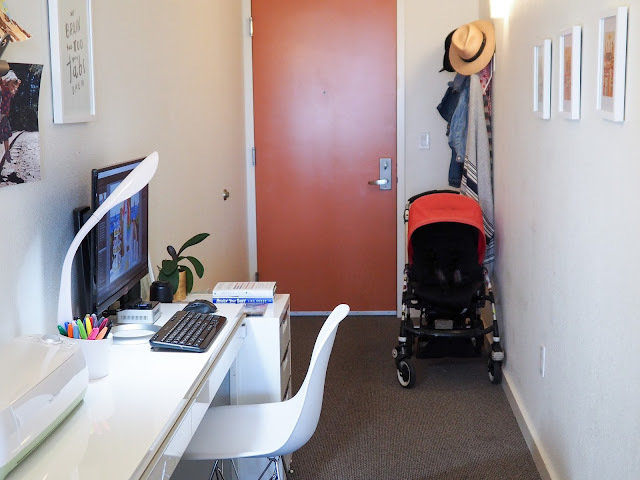 As luck would have it, our apartment features a long entryway, wide and long enough to fit my desk (Ikea Besta Burs), filing cabinet (CB2 tps 3 drawer) and replica Eames dining chair. As you can see, it's also where we store Mathilde's stroller! While this area fits everything I need perfectly, it is lacking in one important factor... there are no windows, and therefore no natural light. For three years I've worked at my desk in lighting conditions that could only be considered sub-optimal. I'm not going to lie, it has caused a lot of strain on my eyes, caused headaches, and has made it hard to concentrate on my work. I've been needing a lighting solution that would fit my narrow desk space with the flexibility to be used for more than just lighting my computer area. I mean, just look at how dark it is in this (unedited) shot below. And this was taken in the early afternoon when the sun coming through the windows in our living room was at its brightest. 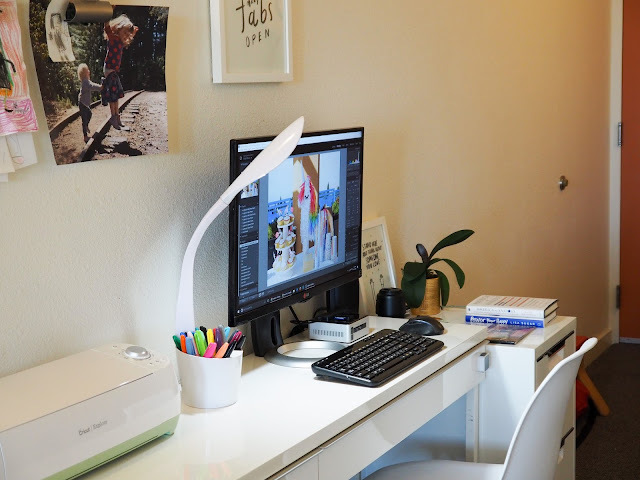 Enter the OttLite LED Desk Space Organizer Lamp. This compact lamp has made a world of difference on my desk. No longer do I feel like I'm straining to see while I work! It takes up very little space on my desk and the style fits in nicely. Just what I needed! 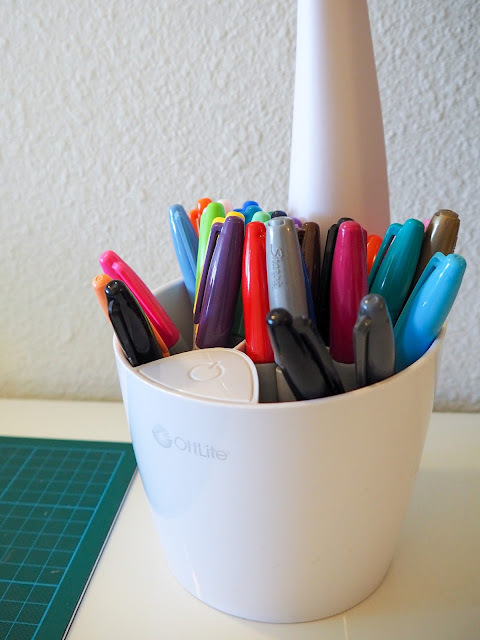 The OttLite LED Desk Space Organizer Lamp has so many cool features. The neck of the lamp is flexible and can be bent to stand at just the right angle I need. It can stand as low as 11 3/4 inches up to 24 3/4 inches tall. It can also be angled in many different ways making it incredibly flexible. There are four different brightness settings that can be adjusted with just a simple tap. The kids love playing with this, of course! The super bright natural daylight LED is rated up to a maximum of 440 lumens and will last up to 40,000 hours. I can tell you, it's definitely getting a work out on my desk! Just look at the difference it makes. My eyes are so much happier! One of my favorite features is the organizer base. Two compartments, perfect for holding pens, pencils, scissors, or in my case, a collection of Sharpies. The base is pretty compact, and in fact, it barely takes up more space on my desk than the mason jar I previously kept my Sharpies in. I love the idea of using the organizer base in a purely decorative way too. Wouldn't it look cute filled with flowers? 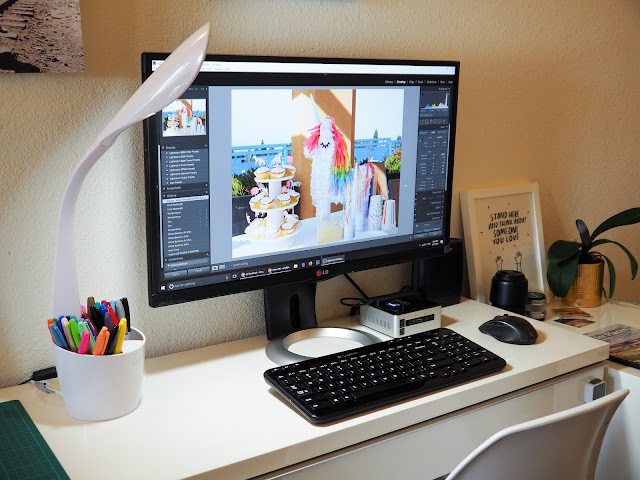 The Desk Space Organizer Lamp is perfect for my little officer space, however Ottlite make plenty of other desk lamps perfect for different needs. Like my lamp, they all provide the very best in lighting for the health of your eyes. You can check them all out here. Need a lamp for your work area? You're in luck! Little Hiccups readers can save 25% on your very own OttLite with the code BLOGGER25 (valid November 7th through December 31st 2016 on in stock lamps). Click here to purchase. You can also enter to win an OttLite lamp of your choice - and win one for a friend too! Enter the giveaway here. Five lucky winners will be selected from all the entries. This giveaway runs from November 7th though December 3rd 2016. Good luck!